At Make Your Wristbands we are proud to offer a wide selection of awareness wristbands that can help you to show your support for various causes that are close to your heart. If you want to avail superfast services for awareness bracelets, do not forget to ask for next day delivery from our experts. At Make Your Wristbands, we deliver wristbands at superfast speed. You can mix and match different sizes, colours and phrases to design your own awareness bracelets. We are one of the best wristbands designing company as you can read through the testimonials written by tens of thousands of our satisfied customers. Our rubber bracelets are non allergic and can be worn for a longer time period as they would not fade away or look worn out after a small time interval. With the availability of no minimum order option, you can even order a single wristband and it would be delivered to you at the earliest. Awareness wristbands are one of the best ways to show your support for a cause. You can buy the wristbands of a particular colour to show your support. So whether you are looking for a customized wristband or for a custom bracelet as a gift, our professionals would help you to find the right wristband. To get in touch with our representatives, you can call Make Your Wristbands at 1(800)715-4445 as we are available for 5 days a week. Our professionals would provide you with the latest information. 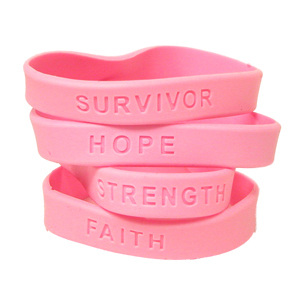 Customized awareness or cancer wristbands are the best way to show your support for a cause or for fund raising events. So the next time you want super fast delivery of awareness rubber bracelets, do not forget to get in touch with professionals at Make Your Wristbands.